The NILE hosts a busy Ranching Heritage Challenge. 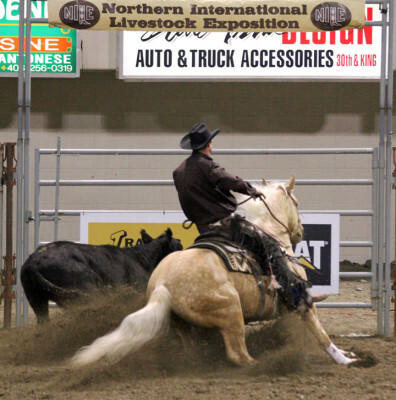 John Wolfe’s Lookin Frosty dominated the open 4-year-old class, under the guidance of Tim Unzicker, scoring a solid 148 and pulling in a first-place check worth $2,370 plus prizes. Already a money earner, this is Lookin Frosty’s biggest single check of his career to date. The palomino was bred by Wagonhound Land & Livestock LLC, and is by WR This Cats Smart and out of the Sun Frost mare PC Sun Chikini. The Wolfes, who live in Roundup, Montana, bought the horse as a yearling, choosing him for his stout build and sweet personality.